MOKGWEETSI E.K. 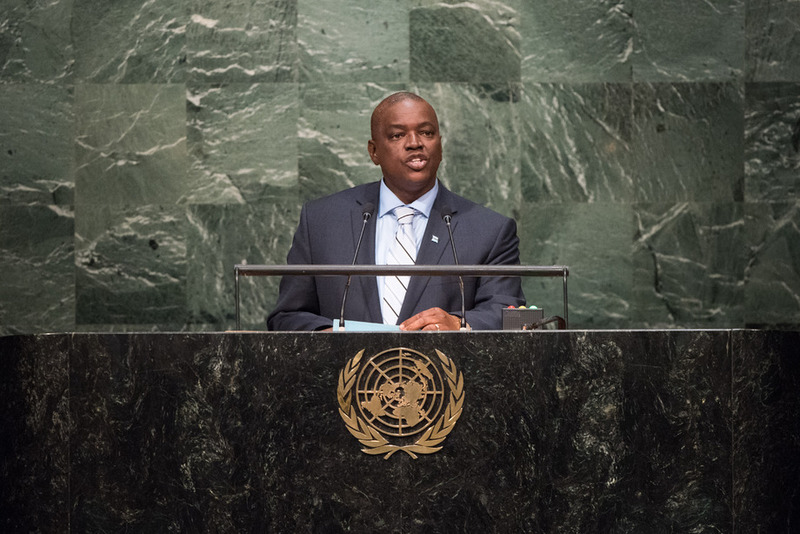 MASISI, Vice-President and Member of Parliament of Botswana, recalled that the Millennium Development Goals had clearly codified the global agenda, focusing on priority areas for meeting the needs of the world’s poorest. While significant progress had been made in recognizing those Goals, the sombre truth was that progress had been largely uneven across and within countries and regions. His country was proud of the tremendous strides it had made in the implementation of those Goals. However, poverty eradication, gender equality, the empowerment of women and girls, job creation, and equal access to health and other services remained high on the country’s national agenda. Botswana also welcomed the new development agenda, which represented a global vision for the sustained prosperity of humankind and the living planet, wherein universal peace and security would form the foundation for sustainable development across all nations. Stressing that the need to adopt a universal, legally binding agreement on climate change at the Paris conference “could not be overemphasized”, he said climate change could lead to potentially catastrophic consequences if left unchecked. The world continued to witness a dangerous rise in sea levels, melting glaciers, severe decline in agricultural output, changing weather patterns and health challenges caused by changes in climatic conditions. Climate change also posed a serious security threat, displacing millions and condemning even greater numbers to subpar living conditions. Developing countries were hardest hit, with limited capacities to respond to those challenges. Particular focus on the new agenda should be given to countries in special situations, and very specific support provided as they built up their economies. In particular, he said, landlocked developing countries would require substantial augmentation of their capacity to implement the new agenda. The same held true for middle-income countries like Botswana. Turning to the present refugee crisis, he said that conflict, political instability and poverty were the main push factors for migration from developing to developed countries, as evidenced by the thousands that continued to cross the Mediterranean into Europe in search of economic opportunities. It was wrong to blame any single country in Europe on its policy towards immigration, as every State had to assess its own ability to accommodate such an influx. It was not Europe’s fault that people were tragically drowning in the sea but that of the countries where the migrants originated. He expressed concern about the serious threats to international peace and security in many parts of the world. “We are witnessing an alarming rise in instability, insecurity and violent conflict, causing untold devastation and human suffering,” he said, urging the international community to take “urgent and decisive action”. Some conflicts were introduced or exacerbated by the involvement of non-State actors and the emergence of terrorism. “In a world where borders are porous and nations evermore interdependent, threats to security in any region have consequences for us all,” he stressed in that regard. In Africa, the situations in Somalia, Libya and South Sudan, to name a few, remained of great concern. The African Union was actively engaged in efforts to resolve the conflicts, and Botswana hoped that lasting solutions could be found before there was any further loss of innocent life.